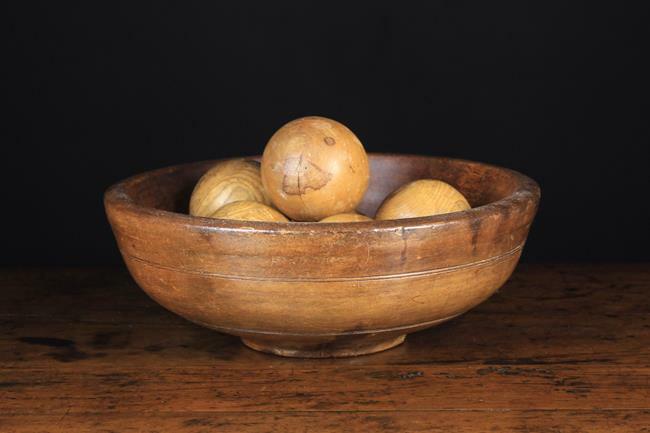 A Turned Treen Bowl & Six Turned Pine Balls. The bowl on a slightly raised foot, 5 in (13 cm) high, 14½ in (37 cm) in diameter. The balls 3½ in (9 cm) in diameter. 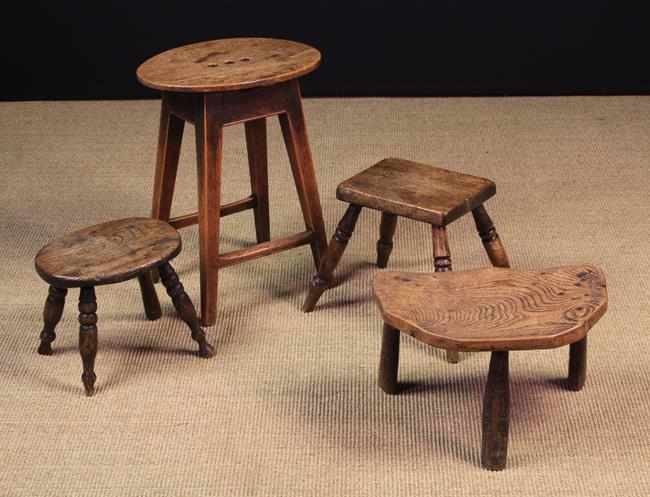 Four 19th Century Country Stools: One with a replaced oval top pierced with three finger holes, standing on a joined ash base of square legs united by peripheral stretchers 19 in (48 cm) high, 15 in x 11 in (38 cm x 28 cm). A rectangular topped stool on turned legs 11 in (28 cm) high, 10 in x 7½ in (25.5 cm x 19 cm). An elm oval topped stool on three knopped baluster legs with a fourth pole turned leg, 9 in (23 cm) high, 11 in x 8 in (28 cm x 20 cm). 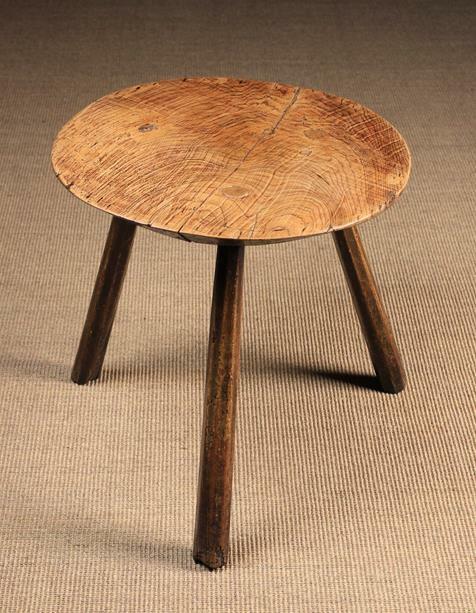 And a rustic three legged stool with elm saddle seat 9½ in (24 cm) high, 16 in x 10 in (40 cm x 25 cm). A Rustic Chopping Block & Three Stools. The chopping block composed of a section of burr figured trunk raised on three splayed chamfered legs 25½ in (64 cm) high, 13 in x 13 in (33 cm x 33 cm). 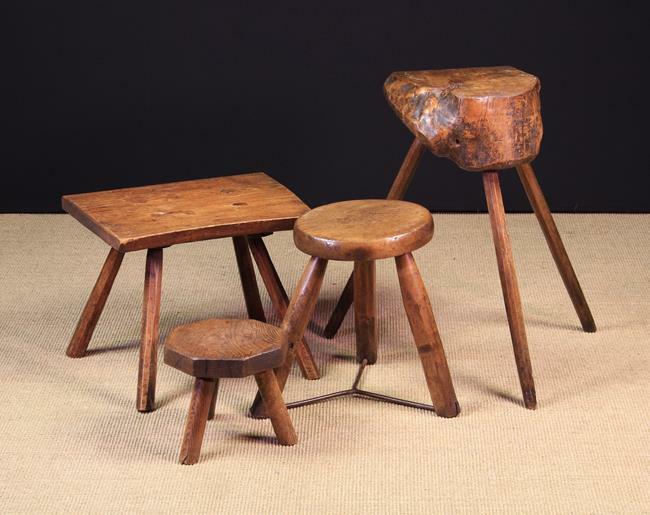 A rectangular topped stool having an ash slab seat morticed and wedged with four chamfered legs 14½ in (37 cm) high, 19 in x 15½ in (48 cm x 39 cm). 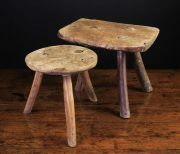 A thick round topped stool on three rustic legs united by an iron triform stretcher 15½ in (39 cm) high, 11½ in (29 cms) in diameter. And a small ash & elm octagonal topped stool on three legs 9 in (23 cm) high, 9½ in (24 cm) wide. 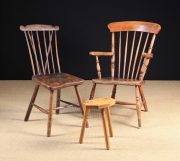 A 19th Century Stick-back Windsor Armchair with curved top rail, a 19th century comb-back Windsor side chair, and a modern ash milking stool with canted slab seat on three pole turned legs 14½ ins (37 cm) high. Two 19th Century Rustic Milking Stools: One with an oblong seat on splayed stick legs; one leg retaining it's outer bark, 10½ (27 cm) high, 13 in x 10 in (33 cm x 25.5 cm), the other stool having a round seat 9 in (23 cm) high, 9 in (23 cm) in diameter. 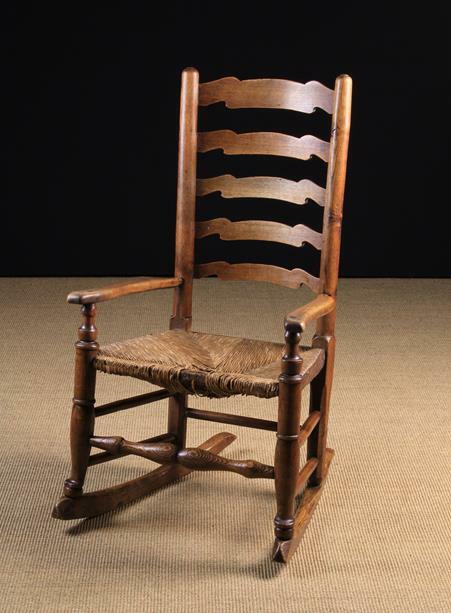 An Early 19th Century Lancashire Ladder-backed Rush-seat Rocking Chair. The five wavy-cut graduated back 'rungs' between round turned uprights. The swept arms on urn knopped posts leading on to form the legs and terminating on pad & squat bun feet above curved rockers united by a twinned baluster front rail and pole stretchers to the sides and rear, 39 ins (99 cm) high, 22 ins (56 cm) wide. An Early 19th Century Ash Cricket Table. The thick figured top with chamfered underside, raised on chamfered legs with traces of residual paintwork, 21 in (54 cm) high, 22 in (56 cm) in diameter. 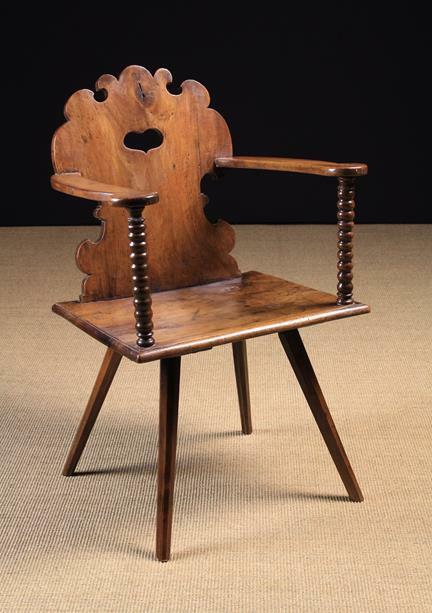 An Unusual 18th/19th Century Walnut Folksy Armchair. The scroll edged single piece plank back pierced with a compressed heart motif to the centre. 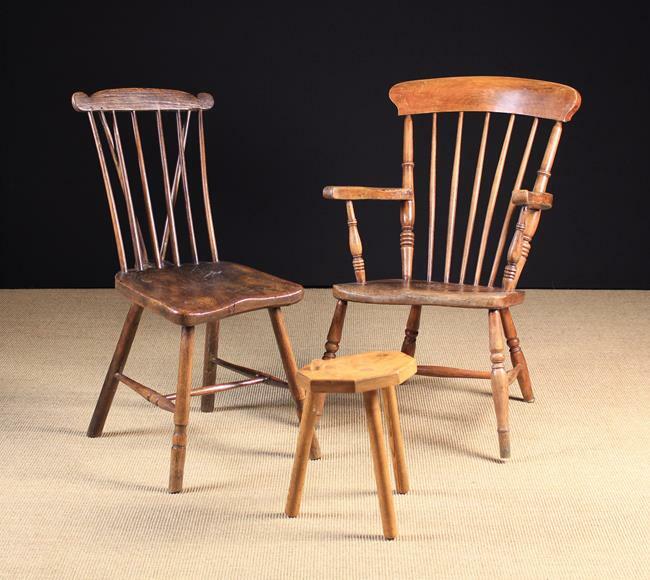 The flat pad end arm-rests pierced through and wedged with the tenons of bobbin turned front supports, leading down to a single piece seat on splayed octagonal tapering legs, 37 ins (94 cm) high, 23½ ins (60 cm) wide. 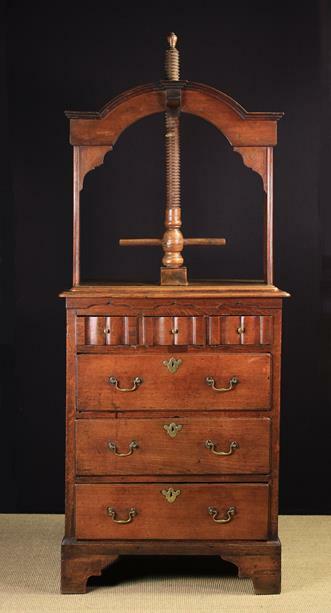 An 18th Century Fruit Wood Low Dresser. 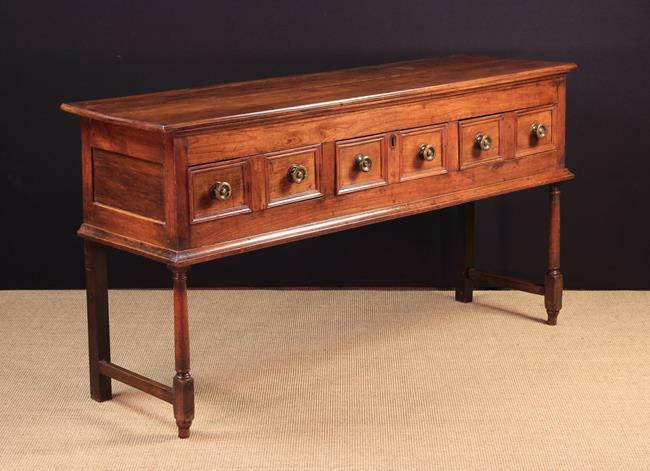 The frieze fitted with three moulded twin panel drawers; each fitted with later pressed brass knob handles, standing on slender turned front legs with square back legs connected by simple end rails, 34½ in (87,5 cm) high, 65 in (165 cm) in length, 19¼ in (49 cm) deep. A Mid 18th Century 'Norfolk' Oak Chest of Drawers with Linen Press. The rectangular top having a central wooden screw-thread clamp suspended from an arched frame, The chest housing three small serpentine front frieze drawers with brass stud handles, above three long lip-moulded drawers with brass swing handles and winged escutcheons raised on bracket feet, approx 79 in (200 cm) in height, 32 in (81 cm) wide, 19½ in (50 cm) deep.